At Superfine!, we believe that art isn't just for the 1%. Anyone can own a piece or two (or three!) that enriches their day, their home, or their whole life. Affordable art is within reach for everyone, and you don’t need a cool million to attain it. You just need to know where to find it—and this guide will help with that. Ready to start building your own collection? We spoke to our team, gallery and artist friends, and a few key Collector's Society members to find out where you can find new emerging contemporary artists and grab some affordable art for yourself. Out of all the social platforms out there, Instagram is by far the best for finding emerging artists, which makes sense given its focus on imagery. And with nearly one billion users, it goes without saying that social media buzz can (and will) carry an artist’s brand and their work far and wide. So, aside from searching for posts tagged #contemporaryart, what's the best way to discover new affordable art? The trick is to follow your favorite galleries and artists, and then follow their favorites, participate in discussions, and remember to be polite and have fun. But who to start with? These days, we’re really into Sean Christopher Ward, a fine artist, the director of HUE Gallery in Wichita, and one of our regular Superfine! exhibitors. Similar to blind box toys you might find in a comic book shop or toy store, Sean has devised an affordable way to collect art in the Collector Cube, a $100 grab bag containing four unique pieces that you don't see in advance. With four artworks per box, Sean’s cubes are also a quick way to amass a big collection! Currently, the boxes only contain Sean's works but he's looking to expand and include other artists into his project. There are also a number of Instagram accounts that curate art and artists. One of our favorites is an account called "The TAX Collection" that aggregates interesting new contemporary art, linking to the artist’s instagram account. These types of profiles make it easy to browse through different contemporary art styles to find something that really appeals to you. And once you find an artist you love, you can contact them through commenting or a DM on Instagram. There are multiple online shops for finding affordable art. Let’s start with some of our favorites. Like us, Clara Arts (one of our Superfine! NYC exhibitors), with its sleek online interface, is very focused on collector-building and spotlighting collages, paintings, and mixed media from a variety of excellent young, up-and-coming artists. Of course, it’s expertly curated—and it’s affordable. If you want to peruse in person, they have a physical location in McGinley Square in Jersey City, NJ. Art Money is an interesting hybrid of online and offline art collecting with a unique twist. It’s a service that lets you discover actual, physical art galleries where you can go directly to find local art—and then pay for that artwork through their easy-to-use financing plans. The payment plans make otherwise unattainable art available for collectors who would normally think that would be out of reach. Currently, the service is available in 600 galleries across Australia, the United States, and New Zealand. There’s also our very own Superfine! E-Fair, which features all the works from the most recent Superfine! fair—in this case, the May 2018 fair that occurred in New York City. Curated by our own team, you can find a wide range of affordable art, and we’ll connect you with the artist or gallery who will then handle the acquisition. Of course, art galleries, where you must physically wander through and interact with real human beings, are some of the best places to find new, affordable art. Since the Superfine! fair travels all over the country, we know a little thing or two about local art galleries, residency programs, and meet-ups. Deep Space Gallery's Keith Garcia, From the Show "The Path of Most Resistance"
Spoke Art is one of our favorite galleries for contemporary art in both New York and San Francisco. They feature several well-curated group shows around various themes such as the films of David Lynch and Wes Anderson, which exposes a non-art crowd to work by talented artists in a very cool and accessible way. We've bought some lovely and macabre little works by Abigail Goldman there. We also recently discovered Shrine Gallery on the Lower East Side, which has a cool selection of outsider artists, some of whom make almost folksy works, but in a contemporary way. We found an amazing original piece by Kevin McNamee-Tweed at a recent show there for just a few hundred dollars. And, from our own exhibitor list, you'll find Deep Space Gallery just across the river in Jersey City, NJ. They bring bring a street art flair to work that's decidedly not just street art—it really works. 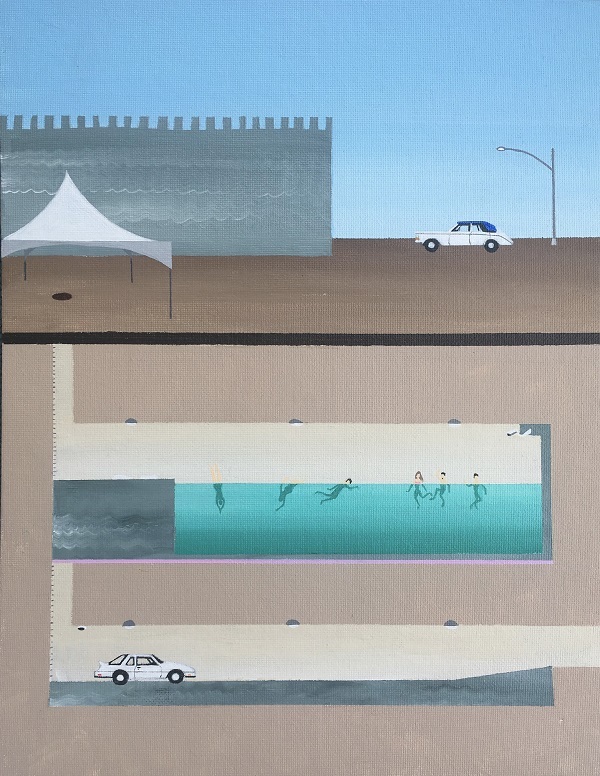 For a small city, Washington, D.C.'s commercial gallery scene is quite spread out, which is one of the reasons we're excited to host Superfine! D.C. at such a central location as Union Market. Some D.C. galleries associated with the fair include Susan Calloway Fine Arts and Rofa Projects, all of which feature a broad array of contemporary work. Also in D.C., our exhibitors at Touchstone Gallery are a non-profit that's been consistently ranked top gallery in D.C. by both the Washington City Paper and the Washington Post, and for good reason. They show a terrific curation of D.C.-based emerging artists, and we're psyched to have them as part of the Superfine! Fair. And just outside of Washington D.C., we love the artists that Adah Rose Bitterbaum features at her Adah Rose Gallery in Kensington, Maryland. A good place to start is collector Kathryn Mikesell's Your Fountainhead advisory. You’ll notice Kathryn's email on that page; send her a note and get on her mailing list, which will ensure your invitation to near-monthly open houses at the Fountainhead Residency, a program operated by her and her husband, Dan, next to their Morningside home. The artists there hail from all over the globe and some of them become major art stars, so it's a way to get in early and meet them one on one, as well as a way to attain blue-chip works (that is: works with exponential resale growth) at entry-level prices. Fountainhead also hosts biannual open houses at the Fountainhead Studios complex in Little River, where about 30+ Miami artists work. You can buy directly from the many talented artists there. On the gallery front, Robert Fontaine Gallery is at the forefront of the commercial gallery scene, along with Bernice Steinbaum, an art world hero who operates her latest project out of her Coconut Grove home. Both galleries feature works by masters of contemporary art as well as more accessible pieces by more emerging artists. Last but not least, Laundromat Art Space in Little Haiti is a must-stop mainstay in this colorful neighborhood—they feature group and solo exhibitions in their gallery space as well as open studios for their resident artists. Get on their mailing list. In L.A., there are a few places that really stick out. Thinkspace Gallery in Culver City has always been right at the forefront of the new contemporary art movement, and they feature small and large works at all price points, as well as very in-demand prints! They host regular openings and print releases, so it's worth it to get on their list whether you live in L.A. or not. We're also very keen on the mission behind Subliminal Projects, artist Shepard Fairey's gallery, which goes above and beyond to spotlight local Angelino upstarts and their work. It's a great way to pick up an affordable work by a future heavy-hitter and get a little piece of OBEY history in the same place. Another stop to make is The Hive Art Gallery and Studios in downtown L.A. There are some great works from both the group shows they curate in their front gallery, and the artists' studios in the back (both of which rotate semi-frequently), including photo work by rising star Parker Day (also on Instagram!). The Hive, like many of the galleries and outlets on this guide, is friendly, accessible, a cool experience, and a great way to get your feet wet in collecting emerging new contemporary work, and some of the best affordable art around. Discover and fall in love with art with ease with Superfine! 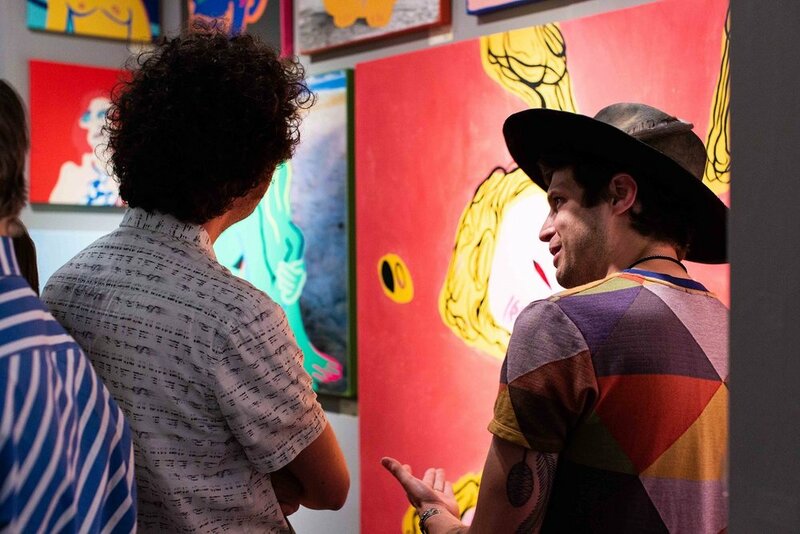 Sign up with your email address to stay in the know with your favorite art fair.